Update: Cyber Monday 2018 is officially over. But don't worry, some of the biggest retailers are keeping their deals going for a few more days (or they simply forgot to take them down), so you still have time to grab a bargain. Black Friday weekend is drawing to a close, but its digital cousin Cyber Monday is here and ready to dish out even more online-exclusive deals. Like Black Friday, Cyber Monday started in the United States as a way for online retailers to boost sales, but now it forms the tail-end of all Black Friday deals in the US, the UK and beyond. Having finally recovered from your epic Thanksgiving meal (or spent your weekend Googling what Thanksgiving is if you're in the UK), logging on for Cyber Monday deals is an easy way to grab a bargain in time for Christmas or just to treat yourself to some cheap gear from Amazon, Currys, Argos etc. Hundreds of online retailers have slashed their prices for Black Friday and Cyber Monday, but it's important to know where to look first – the most obvious choice being Amazon. It's the one place where you can buy pretty much anything, and this yearr they've had massive reductions on speakers, headphones, musical instruments and more. And if you've been pondering the purchase of an Amazon Alexa device, now is your time to strike. And because we're such lovely people here at Louder, we've dug out the very best deals for Black Friday and Cyber Monday. 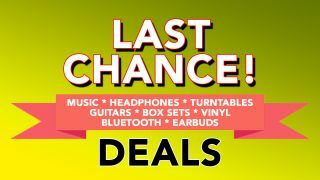 Others may concentrate on cheap Pixelbooks, but if you're after speakers, headphones, turntables or any other musical gear, be sure to check in with us! Sennheiser PXC 480 over-ear noise-cancelling headphones: were $299.95, now $179.95! Marshall Monitor Bluetooth headphones: were £219.99, now £129.99! Our in-house experts at TechRadar said that these headphones were "easily some of the best sounding in-ear noise canceling headphones we've ever put through their paces. Of course, for £250, they better be". Now they're a massive £120 off for the Apple ones, and £100 off for Samsung/Android. Beats By Dr Dre Solo 3 Wireless Break Blue Headphones - were £249.99, now £149.99! The Beats EPs are the affordable Beats: headphones for the masses. With a more balanced sound and cheaper price tag than their big brothers, they sound good and have the iconic logo's made them a household name in just a few years. At half price, they're even more of a steal. Waterproof and shockproof and with a 360 degree speaker, it's 60% off right now – if you buy it in the 'obsidian' colourway, which sounds pretty metal to us. Our in-house experts on TechRadar said: "The Megaboom boasts a powerful sound that's filled with crispness and heady bass. Providing a full, room-filling experience has long been a strong suit of UE's cylindrical Bluetooth speakers, and the larger hardware is just as worthy of the accolade. Every genre of music that we lobbed at it sounds vibrant and expansive." This speaker promises a fancy light show and hefty base, and its portability and waterproof qualities make it great for a day at the beach or lido. Sure, there are other portable speakers on the market that sound a little better, but now it's had its price cut, it's far more in line with other speakers in this price range. Google's answer to Amazon's Echo is Google Home, a voice-activated speaker powered by the Google Assistant. Use your voice to play music, get answers from Google and worry slightly about your sanity. Or maybe that's just us. Google Home works with Android and iOS, plays music, podcasts, news and radio and more. Pro-Ject Essential III GH: was $499.98, now $349.99! Jam Sound Black Turntable - was £119.99, now £49.99! Gibson ES-355 Walnut Maestro VOS Varitone Semi-Hollow Body Electric Guitar - was $7998, now $4499! Epiphone Limited Edition Slash Les Paul Standard Plustop PRO Electric Guitar: was $1499, now $699.77! Wherever it sits in the canon and whatever its limitations, for millions of second-generation Zeppelin fans, too young to see the band live, the film and soundtrack was a crucial imprinting – a doorway to a lifetime’s love, and one that essentially renders any critical appraisal, now or then, redundant. Originally, Cyber Monday had nothing to do with Black Friday, but now they're stuck together in one glorious weekend of bargain hunting and deal grabbing. Back in the midsts of time, Black Friday was primarily an in-store event, urging shoppers to leave their Thanksgiving leftovers behind to buy TVs, laptops, headphones, games consoles and much more at limited low prices. Similarly, Cyber Monday was all about the online deals in the run-up to Christmas, but focussing primarily on clothing and jewellery. But now, thanks to online retailers growing ever larger and our own inherent laziness, everything is online and the lines between Black Friday and Cyber Monday have blurred into one amorphous mass of discounted goods from hundreds of retailers – on and offline. Black Friday is the busiest shopping day of the year – at its peak in 2017, shoppers were spending a mind-boggling $1 million per minute! Originally an American idea and based in real-life stores, gradually Black Friday has moved to the digital world with brands like Amazon, eBay and Apple offering huge deals across the 24-hour period. Some stores extend their deals for longer, capitalising on shoppers' hunger for a good deal. We do love a good deal, don't we? Black Friday was yesterday – Friday November 23. And Black Friday's digital pal Cyber Monday takes place this year on Monday November 26. But, as we've seen this year, the big online retailers won't be confined to the rules of convention: Amazon's Black Friday sale started on November 16 and continues until November 25, where they will no doubt blast out some tasty Cyber Monday deals. What should you buy on Black Friday/Cyber Monday 2018? Headphones. Headphones headphones headphones. We can't stress enough just how many pairs of headphones are reduced in price this Black Friday: just look at our best headphones deals for proof. Shall we say headphones again? Elsewhere, you're going to likely find huge savings on Bluetooth speakers to turn your home into a rock 'n' roll temple. There'll undoubtedly be discounts on smart speakers from Amazon and Google, plus a deal on Prime membership. Keep your eyes peeled and clicking fingers primed for some turntable offers, too. From the portable record players to the best turntables on the market, the likes of Amazon and eBay lowered prices on a ton of products. And don't forget to pick up some actual vinyl to play on those turntables! Amazon already have their own limited edition vinyl section, so it wouldn't be a surprise to see a sudden price drop on LPs and even the odd box set! Last year, online merch store EMP ran a special Cyber Monday campaign with different deals every hour on hundreds of shirts, hoodies and other band-based apparel. Oh, and you can get 20% off Metal Hammer, Classic Rock and Prog magazines by using the code BLK20 at the checkout. Now that's a deal!